Unattended recording of bat calls has become a widely used method to monitor bat activity. The advantage is obvious – several recording units can be administered by one person, which gives a very cost-effective solution. The D240X is a bat detector which is suitable both for traditional, manual monitoring and unattended monitoring. In the automatic triggering mode, the D240X captures the bat calls as they are detected and then plays them back at slower speed. The Zoom H2 is a high-quality digital recorder, using an SD card as storage medium. It is the perfect companion for the D240X both for manual and automatic recording. In the "voice activated" mode it starts recording as soon as the D240X starts playing the bat call, enabling a fully automatic, unattended recording session. 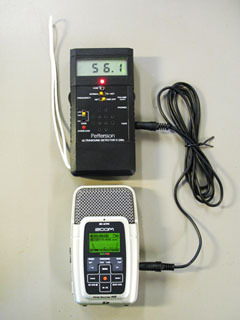 The two units are connected with a 3.5mm plug stereo cord from the TAPE jack of the D240X to the LINE IN jack of the Zoom H2. Other switches can be set as desired (please refer to the D240X Operating Instructions for more information). To start a recording session, switch on both the D240X and Zoom H2 and press the red Recording button on the Zoom H2 once. The text "Wait for signal..." is displayed. Make a sound, e.g. by snapping two fingers, to trigger the D240X and verify that the Zoom H2 starts recording the signal. To end the recording session, press the PLAY/PAUSE key of the Zoom H2 and turn off both devices. The recorded files will have the time expanded signal on the right channel and the heterodyne signal on the left channel. The instructions above are for Zoom H2 firmware version 1.8.